It all began in 1928 when 17 women, gathered by Edna Woolman Chase, Editor-in-Chief of Vogue, met for lunch in a modest midtown New York restaurant. They had three things in common: Each held a job of consequence in the business of fashion, each held all the others in high regard and together they held a belief that fashion needed a forum, a stage, or a force to express and enhance a widening awareness of the American fashion business and of women’s roles in that business. 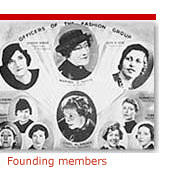 The Fashion Group®, conceived at an informal luncheon in 1928 became an organization in 1930, with a place, a purpose, by-laws, officers and women eager to be members. 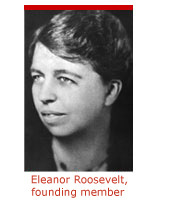 Their first office space was donated by Louis Fairchild in his Women's Wear Daily building on East 12th Street. The second office space was at 572 Madison Avenue, donated by Harper’s Bazaar. Then in 1934, from the minutes of the Board meeting of October 18: Discussion as to how to meet the rent of the contemplated space in 30 Rockefeller Center included a Fashion Group party using talent within the membership lampooning fashion, to be known as The Fashion Follies™. Today, The Fashion Group® offers membership to both men and women.